[Mariah, Ushahidi] I need to create an excel file of all users in my deployment. How do I do that? [Jason Mule, Ushahidi] Hi Mariah. We don't support exports at the moment. For now, you might want to export that data directly from the database. [Mariah, Ushahidi] Ah okay, hmm can we do something like get list of users from the API? [Mariah, Ushahidi] ah okay only when I'm logged in as admin? [Mariah, Ushahidi] Btw, I'm getting error in registration. [Mariah, Ushahidi] When I logged in as admin and check my account details I could see my details correctly. And I logged out. Then I tried to log in using another user, when I tried to view my account details, I was getting the details of the previous logged in user which is the admin. [Will, Ushahidi] Could that be a cache issue? If it's caching the user as 'me'? [Will, Ushahidi] @Jason is it reasonable to expire all caches on logout? [Jason Mule, Ushahidi] Maybe the user cache on logout? [Will, Ushahidi] is this a candidate for the hot fix process? [Jason Mule, Ushahidi] cool, thanks. [Jason Mule, Ushahidi] I think it's a normal bug? [Jason Mule, Ushahidi] Probably not an ideal for 2 users using a deployment on the same device. [Will, Ushahidi] hmmmm, that's a bit strange, that I have not seen, @jason? [Mariah, Ushahidi] then I'm getting this: The requested URL /views/map was not found on this server. [Will, Ushahidi] what is your setup? [Will, Ushahidi] @Jason any thoughts? [Will, Ushahidi] thanks for finding the user bug! [Will, Ushahidi] @Jason I've fixed the user cache issue, can you review when you have time, thanks! [Mariah, Ushahidi] @Will how can I get the update? [Mariah, Ushahidi] @Will so I'll just do a git pull request? [Will, Ushahidi] what branch are you working from? [Will, Ushahidi] is it master or develop? [Mariah, Ushahidi] What should I do now? [Mariah, Ushahidi] I really don't understand t he process, can you please enlighten me? [Mariah, Ushahidi] Question, what should be the From number? [Will, Ushahidi] groovy, can you walk me through what's happening, are you getting errors? [Mariah, Ushahidi] is that the number we purchased from Nexmo? [Mariah, Ushahidi] Also the secret valu what is that? [Mariah, Ushahidi] So that's the same with API Secret? [Mariah, Ushahidi] Is the secret value the same with API Secret? [Will, Ushahidi] Yes for the moment, set that to be the same as the nexmo api secret, though it appears to be unused at the moment. [Mariah, Ushahidi] now what's next? [Will, Ushahidi] @Jason do the dataproviders need to be configured on the api to run the requests? [Will, Ushahidi] can you check application/logs in the root dir for the api and tell me if there are any error messages? [Mariah, Ushahidi] Are you talking to me or to Jason? [Mariah, Ushahidi] @Will is that in platform or client? [Jason Mule, Ushahidi] Have those been configured as cron jobs yet? [Jason Mule, Ushahidi] hmmm...but then again, we don't have docs for that yet. [Mariah, Ushahidi] how to do that? [Mariah, Ushahidi] and why do we nee to setup the cron? [Mariah, Ushahidi] So how do we get started? [Will, Ushahidi] @Jason do we have a script we can share? [Jason Mule, Ushahidi] not really. You have to add them manually at the moment. [Jason Mule, Ushahidi] @MariahGuest You need to set up a cron job to periodically check for messages and this points to bin/ushahidi dataprovider incoming. [Mariah, Ushahidi] @Jason how do we do that? [Jason Mule, Ushahidi] Is the API installed on Ubuntu? [Mariah, Ushahidi] Can you send the whole command? [Mariah, Ushahidi] maybe you meant plugins/nexmo ? [Jason Mule, Ushahidi] ok, you could test by running the command on the command line. [Mariah, Ushahidi] Is this correct? [Mariah, Ushahidi] there's a space between dataprovider and incoming? [Jason Mule, Ushahidi] That is the cron config. [Mariah, Ushahidi] oh wait, what's the first command? this one: sudo crontab -e? [Jason Mule, Ushahidi] Yes, Please take a look at cron wiki page as well. It might be difficult to guide you through this process as this is specific to your system. [Jason Mule, Ushahidi] Could you also test that you can pull messages by running that command on the command line? [Mariah, Ushahidi] WHat do I do next? [Mariah, Ushahidi] How do I insert the cron job? [Mariah, Ushahidi] @Jason how can I test if it's already pulling messages from Nexmo? [Mariah, Ushahidi] how do I test if it's getting the messages from Nexmo? [Will, Ushahidi] what was the output from the above commands? [Will, Ushahidi] yep and what's the output? [Mariah, Ushahidi] what's the complete command? [Will, Ushahidi] so first are you in the root dir for platform? [Mariah, Ushahidi] How can I do that? [Mariah, Ushahidi] Can you guide me again with cron? [Mariah, Ushahidi] Can we do it from the start? [Will, Ushahidi] are you in the root dir for platform? [Will, Ushahidi] can you run the command pwd and paste the output here? [Mariah, Ushahidi] then what's next? [Mariah, Ushahidi] how to run the cron job? [Mariah, Ushahidi] How to check if it's pulling? [Mariah, Ushahidi] okay I need to edit again? [Mariah, Ushahidi] Can it get existing messages? [Mariah, Ushahidi] Can we make it to fetch every 1 min? [Mariah, Ushahidi] Why does it need to have 0? [Will, Ushahidi] can you try without the incoming? [Will, Ushahidi] do new nexmo messages appear in client when that command is run? [Will, Ushahidi] ah so no new message have come through nexmo at all? [Will, Ushahidi] there are no logs? [Mariah, Ushahidi] Server time in what? [Will, Ushahidi] are you using the vagrant install of platform? [Will, Ushahidi] or how is platform setup? [Will, Ushahidi] there are definitely message waiting in nexmo yeah? [Will, Ushahidi] @MariahGuest I'm going to have to try to setup locally with nexmo to debug so it's going to take me about an hour. I have to finish one other piece of work - which should take me 15mins and then I can look again. I think we're the same time zone. Is it ok if I come back to you at 3:15pm EDT? [Will, Ushahidi] how do you mean? [Will, Ushahidi] are there tweets to pull? [Mariah, Ushahidi] Would you like to test my keys? [Mariah, Ushahidi] Can you pull msgs from nexmo? [Mariah, Ushahidi] oh you mean the client? [Will, Ushahidi] which one do you have setup? [Will, Ushahidi] what do you have configured as the call back url? and where is it set? [Will, Ushahidi] does that make sense? [Will, Ushahidi] it's already set to http://api.impactumbrella.com/sms/nexmo/reply? [Mariah, Ushahidi] Why does it need to have sms dir? [Mariah, Ushahidi] wait, what's reply? [Mariah, Ushahidi] is that a dir? [Zack Halloran, Ushahidi] @MariahGuest3 You do not need to create a new directory. That is a virtual route on the API. If you go to http://api.impactumbrella.com/sms/nexmo/reply you'll see a response from the API. [Zack Halloran, Ushahidi] It's an error message right now, but if you send a message via Nexmo to that end point it should receive and process it for your deployment. [Zack Halloran, Ushahidi] The best thing to do at this point is set http://api.impactumbrella.com/sms/nexmo/reply as the Callback for your Nexmo number and try sending a test SMS message to make sure it works properly. 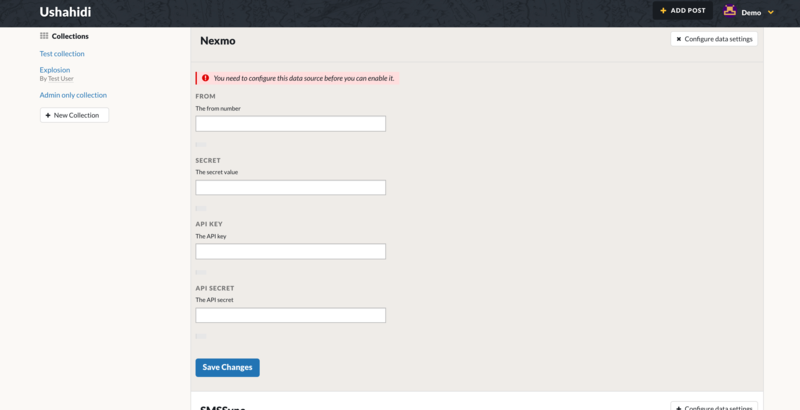 [Zack Halloran, Ushahidi] If you are sending a SMS auto-response, I think you're better off setting that up in Nexmo. Ushahidi does not natively send SMS messages. It requires a service like Nexmo to accomplish it. [Will, Ushahidi] @MariahGuest slow in what way, as in it takes a long time to retrieve the messages? [Will, Ushahidi] does that help? [Ush Bot · ushbot, Ushahidi] [ushbot] [Will, Ushahidi] does that help? [Ush Bot · ushbot, Ushahidi] [ushbot] [Ush Bot · ushbot, Ushahidi] [ushbot] [Will, Ushahidi] does that help? [Ush Bot · ushbot, Ushahidi] [ushbot] [Ush Bot · ushbot, Ushahidi] [ushbot] [Ush Bot · ushbot, Ushahidi] [ushbot] [Will, Ushahidi] does that help? [Ush Bot · ushbot, Ushahidi] [ushbot] [Ush Bot · ushbot, Ushahidi] [ushbot] [Ush Bot · ushbot, Ushahidi] [ushbot] [Ush Bot · ushbot, Ushahidi] [ushbot] [Will, Ushahidi] does that help? [Ush Bot · ushbot, Ushahidi] [ushbot] [Ush Bot · ushbot, Ushahidi] [ushbot] [Ush Bot · ushbot, Ushahidi] [ushbot] [Ush Bot · ushbot, Ushahidi] [ushbot] [Ush Bot · ushbot, Ushahidi] [ushbot] [Will, Ushahidi] does that help? [Ush Bot · ushbot, Ushahidi] [ushbot] [Ush Bot · ushbot, Ushahidi] [ushbot] [Ush Bot · ushbot, Ushahidi] [ushbot] [Ush Bot · ushbot, Ushahidi] [ushbot] [Ush Bot · ushbot, Ushahidi] [ushbot] [Ush Bot · ushbot, Ushahidi] [ushbot] [Will, Ushahidi] does that help? [Ush Bot · ushbot, Ushahidi] [ushbot] [Ush Bot · ushbot, Ushahidi] [ushbot] [Ush Bot · ushbot, Ushahidi] [ushbot] [Ush Bot · ushbot, Ushahidi] [ushbot] [Ush Bot · ushbot, Ushahidi] [ushbot] [Ush Bot · ushbot, Ushahidi] [ushbot] [Ush Bot · ushbot, Ushahidi] [ushbot] [Will, Ushahidi] does that help? [Ush Bot · ushbot, Ushahidi] [ushbot] [Ush Bot · ushbot, Ushahidi] [ushbot] [Ush Bot · ushbot, Ushahidi] [ushbot] [Ush Bot · ushbot, Ushahidi] [ushbot] [Ush Bot · ushbot, Ushahidi] [ushbot] [Ush Bot · ushbot, Ushahidi] [ushbot] [Ush Bot · ushbot, Ushahidi] [ushbot] [Ush Bot · ushbot, Ushahidi] [ushbot] [Will, Ushahidi] does that help? [Ush Bot · ushbot, Ushahidi] [ushbot] [Ush Bot · ushbot, Ushahidi] [ushbot] [Ush Bot · ushbot, Ushahidi] [ushbot] [Ush Bot · ushbot, Ushahidi] [ushbot] [Ush Bot · ushbot, Ushahidi] [ushbot] [Ush Bot · ushbot, Ushahidi] [ushbot] [Ush Bot · ushbot, Ushahidi] [ushbot] [Ush Bot · ushbot, Ushahidi] [ushbot] [Ush Bot · ushbot, Ushahidi] [ushbot] [Will, Ushahidi] does that help? [Ush Bot · ushbot, Ushahidi] [ushbot] [Ush Bot · ushbot, Ushahidi] [ushbot] [Ush Bot · ushbot, Ushahidi] [ushbot] [Ush Bot · ushbot, Ushahidi] [ushbot] [Ush Bot · ushbot, Ushahidi] [ushbot] [Ush Bot · ushbot, Ushahidi] [ushbot] [Ush Bot · ushbot, Ushahidi] [ushbot] [Ush Bot · ushbot, Ushahidi] [ushbot] [Ush Bot · ushbot, Ushahidi] [ushbot] [Ush Bot · ushbot, Ushahidi] [ushbot] [Will, Ushahidi] does that help? [Ush Bot · ushbot, Ushahidi] [ushbot] [Ush Bot · ushbot, Ushahidi] [ushbot] [Ush Bot · ushbot, Ushahidi] [ushbot] [Ush Bot · ushbot, Ushahidi] [ushbot] [Ush Bot · ushbot, Ushahidi] [ushbot] [Ush Bot · ushbot, Ushahidi] [ushbot] [Ush Bot · ushbot, Ushahidi] [ushbot] [Ush Bot · ushbot, Ushahidi] [ushbot] [Ush Bot · ushbot, Ushahidi] [ushbot] [Ush Bot · ushbot, Ushahidi] [ushbot] [Ush Bot · ushbot, Ushahidi] [ushbot] [Will, Ushahidi] does that help? [Ush Bot · ushbot, Ushahidi] [ushbot] [Ush Bot · ushbot, Ushahidi] [ushbot] [Ush Bot · ushbot, Ushahidi] [ushbot] [Ush Bot · ushbot, Ushahidi] [ushbot] [Ush Bot · ushbot, Ushahidi] [ushbot] [Ush Bot · ushbot, Ushahidi] [ushbot] [Ush Bot · ushbot, Ushahidi] [ushbot] [Ush Bot · ushbot, Ushahidi] [ushbot] [Ush Bot · ushbot, Ushahidi] [ushbot] [Ush Bot · ushbot, Ushahidi] [ushbot] [Ush Bot · ushbot, Ushahidi] [ushbot] [Ush Bot · ushbot, Ushahidi] [ushbot] [Will, Ushahidi] does that help? [Ush Bot · ushbot, Ushahidi] [ushbot] [Ush Bot · ushbot, Ushahidi] [ushbot] [Ush Bot · ushbot, Ushahidi] [ushbot] [Ush Bot · ushbot, Ushahidi] [ushbot] [Ush Bot · ushbot, Ushahidi] [ushbot] [Ush Bot · ushbot, Ushahidi] [ushbot] [Ush Bot · ushbot, Ushahidi] [ushbot] [Ush Bot · ushbot, Ushahidi] [ushbot] [Ush Bot · ushbot, Ushahidi] [ushbot] [Ush Bot · ushbot, Ushahidi] [ushbot] [Ush Bot · ushbot, Ushahidi] [ushbot] [Ush Bot · ushbot, Ushahidi] [ushbot] [Ush Bot · ushbot, Ushahidi] [ushbot] [Will, Ushahidi] does that help? [Ush Bot · ushbot, Ushahidi] [ushbot] [Ush Bot · ushbot, Ushahidi] [ushbot] [Ush Bot · ushbot, Ushahidi] [ushbot] [Ush Bot · ushbot, Ushahidi] [ushbot] [Ush Bot · ushbot, Ushahidi] [ushbot] [Ush Bot · ushbot, Ushahidi] [ushbot] [Ush Bot · ushbot, Ushahidi] [ushbot] [Ush Bot · ushbot, Ushahidi] [ushbot] [Ush Bot · ushbot, Ushahidi] [ushbot] [Ush Bot · ushbot, Ushahidi] [ushbot] [Ush Bot · ushbot, Ushahidi] [ushbot] [Ush Bot · ushbot, Ushahidi] [ushbot] [Ush Bot · ushbot, Ushahidi] [ushbot] [Ush Bot · ushbot, Ushahidi] [ushbot] [Will, Ushahidi] does that help? [Ush Bot · ushbot, Ushahidi] [ushbot] [Ush Bot · ushbot, Ushahidi] [ushbot] [Ush Bot · ushbot, Ushahidi] [ushbot] [Ush Bot · ushbot, Ushahidi] [ushbot] [Ush Bot · ushbot, Ushahidi] [ushbot] [Ush Bot · ushbot, Ushahidi] [ushbot] [Ush Bot · ushbot, Ushahidi] [ushbot] [Ush Bot · ushbot, Ushahidi] [ushbot] [Ush Bot · ushbot, Ushahidi] [ushbot] [Ush Bot · ushbot, Ushahidi] [ushbot] [Ush Bot · ushbot, Ushahidi] [ushbot] [Ush Bot · ushbot, Ushahidi] [ushbot] [Ush Bot · ushbot, Ushahidi] [ushbot] [Ush Bot · ushbot, Ushahidi] [ushbot] [Ush Bot · ushbot, Ushahidi] [ushbot] [Will, Ushahidi] does that help? [Ush Bot · ushbot, Ushahidi] [ushbot] [Ush Bot · ushbot, Ushahidi] [ushbot] [Ush Bot · ushbot, Ushahidi] [ushbot] [Ush Bot · ushbot, Ushahidi] [ushbot] [Ush Bot · ushbot, Ushahidi] [ushbot] [Ush Bot · ushbot, Ushahidi] [ushbot] [Ush Bot · ushbot, Ushahidi] [ushbot] [Ush Bot · ushbot, Ushahidi] [ushbot] [Ush Bot · ushbot, Ushahidi] [ushbot] [Ush Bot · ushbot, Ushahidi] [ushbot] [Ush Bot · ushbot, Ushahidi] [ushbot] [Ush Bot · ushbot, Ushahidi] [ushbot] [Ush Bot · ushbot, Ushahidi] [ushbot] [Ush Bot · ushbot, Ushahidi] [ushbot] [Ush Bot · ushbot, Ushahidi] [ushbot] [Ush Bot · ushbot, Ushahidi] [ushbot] [Will, Ushahidi] does that help? [Ush Bot · ushbot, Ushahidi] [ushbot] [Ush Bot · ushbot, Ushahidi] [ushbot] [Ush Bot · ushbot, Ushahidi] [ushbot] [Ush Bot · ushbot, Ushahidi] [ushbot] [Ush Bot · ushbot, Ushahidi] [ushbot] [Ush Bot · ushbot, Ushahidi] [ushbot] [Ush Bot · ushbot, Ushahidi] [ushbot] [Ush Bot · ushbot, Ushahidi] [ushbot] [Ush Bot · ushbot, Ushahidi] [ushbot] [Ush Bot · ushbot, Ushahidi] [ushbot] [Ush Bot · ushbot, Ushahidi] [ushbot] [Ush Bot · ushbot, Ushahidi] [ushbot] [Ush Bot · ushbot, Ushahidi] [ushbot] [Ush Bot · ushbot, Ushahidi] [ushbot] [Ush Bot · ushbot, Ushahidi] [ushbot] [Ush Bot · ushbot, Ushahidi] [ushbot] [Ush Bot · ushbot, Ushahidi] [ushbot] [Will, Ushahidi] does that help? [Ush Bot · ushbot, Ushahidi] [ushbot] [Ush Bot · ushbot, Ushahidi] [ushbot] [Ush Bot · ushbot, Ushahidi] [ushbot] [Ush Bot · ushbot, Ushahidi] [ushbot] [Ush Bot · ushbot, Ushahidi] [ushbot] [Ush Bot · ushbot, Ushahidi] [ushbot] [Ush Bot · ushbot, Ushahidi] [ushbot] [Ush Bot · ushbot, Ushahidi] [ushbot] [Ush Bot · ushbot, Ushahidi] [ushbot] [Ush Bot · ushbot, Ushahidi] [ushbot] [Ush Bot · ushbot, Ushahidi] [ushbot] [Ush Bot · ushbot, Ushahidi] [ushbot] [Ush Bot · ushbot, Ushahidi] [ushbot] [Ush Bot · ushbot, Ushahidi] [ushbot] [Ush Bot · ushbot, Ushahidi] [ushbot] [Ush Bot · ushbot, Ushahidi] [ushbot] [Ush Bot · ushbot, Ushahidi] [ushbot] [Ush Bot · ushbot, Ushahidi] [ushbot] [Will, Ushahidi] does that help? [Ush Bot · ushbot, Ushahidi] [ushbot] [Ush Bot · ushbot, Ushahidi] [ushbot] [Ush Bot · ushbot, Ushahidi] [ushbot] [Ush Bot · ushbot, Ushahidi] [ushbot] [Ush Bot · ushbot, Ushahidi] [ushbot] [Ush Bot · ushbot, Ushahidi] [ushbot] [Ush Bot · ushbot, Ushahidi] [ushbot] [Ush Bot · ushbot, Ushahidi] [ushbot] [Ush Bot · ushbot, Ushahidi] [ushbot] [Ush Bot · ushbot, Ushahidi] [ushbot] [Ush Bot · ushbot, Ushahidi] [ushbot] [Ush Bot · ushbot, Ushahidi] [ushbot] [Ush Bot · ushbot, Ushahidi] [ushbot] [Ush Bot · ushbot, Ushahidi] [ushbot] [Ush Bot · ushbot, Ushahidi] [ushbot] [Ush Bot · ushbot, Ushahidi] [ushbot] [Ush Bot · ushbot, Ushahidi] [ushbot] [Ush Bot · ushbot, Ushahidi] [ushbot] [Ush Bot · ushbot, Ushahidi] [ushbot] [Will, Ushahidi] does that help? [Ush Bot · ushbot, Ushahidi] [ushbot] [Ush Bot · ushbot, Ushahidi] [ushbot] [Ush Bot · ushbot, Ushahidi] [ushbot] [Ush Bot · ushbot, Ushahidi] [ushbot] [Ush Bot · ushbot, Ushahidi] [ushbot] [Ush Bot · ushbot, Ushahidi] [ushbot] [Ush Bot · ushbot, Ushahidi] [ushbot] [Ush Bot · ushbot, Ushahidi] [ushbot] [Ush Bot · ushbot, Ushahidi] [ushbot] [Ush Bot · ushbot, Ushahidi] [ushbot] [Ush Bot · ushbot, Ushahidi] [ushbot] [Ush Bot · ushbot, Ushahidi] [ushbot] [Ush Bot · ushbot, Ushahidi] [ushbot] [Ush Bot · ushbot, Ushahidi] [ushbot] [Ush Bot · ushbot, Ushahidi] [ushbot] [Ush Bot · ushbot, Ushahidi] [ushbot] [Ush Bot · ushbot, Ushahidi] [ushbot] [Ush Bot · ushbot, Ushahidi] [ushbot] [Ush Bot · ushbot, Ushahidi] [ushbot] [Ush Bot · ushbot, Ushahidi] [ushbot] [Will, Ushahidi] does that help? [Ush Bot · ushbot, Ushahidi] [ushbot] [Ush Bot · ushbot, Ushahidi] [ushbot] [Ush Bot · ushbot, Ushahidi] [ushbot] [Ush Bot · ushbot, Ushahidi] [ushbot] [Ush Bot · ushbot, Ushahidi] [ushbot] [Ush Bot · ushbot, Ushahidi] [ushbot] [Ush Bot · ushbot, Ushahidi] [ushbot] [Ush Bot · ushbot, Ushahidi] [ushbot] [Ush Bot · ushbot, Ushahidi] [ushbot] [Ush Bot · ushbot, Ushahidi] [ushbot] [Ush Bot · ushbot, Ushahidi] [ushbot] [Ush Bot · ushbot, Ushahidi] [ushbot] [Ush Bot · ushbot, Ushahidi] [ushbot] [Ush Bot · ushbot, Ushahidi] [ushbot] [Ush Bot · ushbot, Ushahidi] [ushbot] [Ush Bot · ushbot, Ushahidi] [ushbot] [Ush Bot · ushbot, Ushahidi] [ushbot] [Ush Bot · ushbot, Ushahidi] [ushbot] [Ush Bot · ushbot, Ushahidi] [ushbot] [Ush Bot · ushbot, Ushahidi] [ushbot] [Ush Bot · ushbot, Ushahidi] [ushbot] [Will, Ushahidi] does that help? [Ush Bot · ushbot, Ushahidi] [ushbot] [Ush Bot · ushbot, Ushahidi] [ushbot] [Ush Bot · ushbot, Ushahidi] [ushbot] [Ush Bot · ushbot, Ushahidi] [ushbot] [Ush Bot · ushbot, Ushahidi] [ushbot] [Ush Bot · ushbot, Ushahidi] [ushbot] [Ush Bot · ushbot, Ushahidi] [ushbot] [Ush Bot · ushbot, Ushahidi] [ushbot] [Ush Bot · ushbot, Ushahidi] [ushbot] [Ush Bot · ushbot, Ushahidi] [ushbot] [Ush Bot · ushbot, Ushahidi] [ushbot] [Ush Bot · ushbot, Ushahidi] [ushbot] [Ush Bot · ushbot, Ushahidi] [ushbot] [Ush Bot · ushbot, Ushahidi] [ushbot] [Ush Bot · ushbot, Ushahidi] [ushbot] [Ush Bot · ushbot, Ushahidi] [ushbot] [Ush Bot · ushbot, Ushahidi] [ushbot] [Ush Bot · ushbot, Ushahidi] [ushbot] [Ush Bot · ushbot, Ushahidi] [ushbot] [Ush Bot · ushbot, Ushahidi] [ushbot] [Ush Bot · ushbot, Ushahidi] [ushbot] [Ush Bot · ushbot, Ushahidi] [ushbot] [Will, Ushahidi] does that help? [Ush Bot · ushbot, Ushahidi] [ushbot] [Ush Bot · ushbot, Ushahidi] [ushbot] [Ush Bot · ushbot, Ushahidi] [ushbot] [Ush Bot · ushbot, Ushahidi] [ushbot] [Ush Bot · ushbot, Ushahidi] [ushbot] [Ush Bot · ushbot, Ushahidi] [ushbot] [Ush Bot · ushbot, Ushahidi] [ushbot] [Ush Bot · ushbot, Ushahidi] [ushbot] [Ush Bot · ushbot, Ushahidi] [ushbot] [Ush Bot · ushbot, Ushahidi] [ushbot] [Ush Bot · ushbot, Ushahidi] [ushbot] [Ush Bot · ushbot, Ushahidi] [ushbot] [Ush Bot · ushbot, Ushahidi] [ushbot] [Ush Bot · ushbot, Ushahidi] [ushbot] [Ush Bot · ushbot, Ushahidi] [ushbot] [Ush Bot · ushbot, Ushahidi] [ushbot] [Ush Bot · ushbot, Ushahidi] [ushbot] [Ush Bot · ushbot, Ushahidi] [ushbot] [Ush Bot · ushbot, Ushahidi] [ushbot] [Ush Bot · ushbot, Ushahidi] [ushbot] [Ush Bot · ushbot, Ushahidi] [ushbot] [Ush Bot · ushbot, Ushahidi] [ushbot] [Ush Bot · ushbot, Ushahidi] [ushbot] [Will, Ushahidi] does that help? [Ush Bot · ushbot, Ushahidi] [ushbot] [Ush Bot · ushbot, Ushahidi] [ushbot] [Ush Bot · ushbot, Ushahidi] [ushbot] [Ush Bot · ushbot, Ushahidi] [ushbot] [Ush Bot · ushbot, Ushahidi] [ushbot] [Ush Bot · ushbot, Ushahidi] [ushbot] [Ush Bot · ushbot, Ushahidi] [ushbot] [Ush Bot · ushbot, Ushahidi] [ushbot] [Ush Bot · ushbot, Ushahidi] [ushbot] [Ush Bot · ushbot, Ushahidi] [ushbot] [Ush Bot · ushbot, Ushahidi] [ushbot] [Ush Bot · ushbot, Ushahidi] [ushbot] [Ush Bot · ushbot, Ushahidi] [ushbot] [Ush Bot · ushbot, Ushahidi] [ushbot] [Ush Bot · ushbot, Ushahidi] [ushbot] [Ush Bot · ushbot, Ushahidi] [ushbot] [Ush Bot · ushbot, Ushahidi] [ushbot] [Ush Bot · ushbot, Ushahidi] [ushbot] [Ush Bot · ushbot, Ushahidi] [ushbot] [Ush Bot · ushbot, Ushahidi] [ushbot] [Ush Bot · ushbot, Ushahidi] [ushbot] [Ush Bot · ushbot, Ushahidi] [ushbot] [Ush Bot · ushbot, Ushahidi] [ushbot] [Ush Bot · ushbot, Ushahidi] [ushbot] [Will, Ushahidi] does that help? [Ush Bot · ushbot, Ushahidi] [ushbot] [Ush Bot · ushbot, Ushahidi] [ushbot] [Ush Bot · ushbot, Ushahidi] [ushbot] [Ush Bot · ushbot, Ushahidi] [ushbot] [Ush Bot · ushbot, Ushahidi] [ushbot] [Ush Bot · ushbot, Ushahidi] [ushbot] [Ush Bot · ushbot, Ushahidi] [ushbot] [Ush Bot · ushbot, Ushahidi] [ushbot] [Ush Bot · ushbot, Ushahidi] [ushbot] [Ush Bot · ushbot, Ushahidi] [ushbot] [Ush Bot · ushbot, Ushahidi] [ushbot] [Ush Bot · ushbot, Ushahidi] [ushbot] [Ush Bot · ushbot, Ushahidi] [ushbot] [Ush Bot · ushbot, Ushahidi] [ushbot] [Ush Bot · ushbot, Ushahidi] [ushbot] [Ush Bot · ushbot, Ushahidi] [ushbot] [Ush Bot · ushbot, Ushahidi] [ushbot] [Ush Bot · ushbot, Ushahidi] [ushbot] [Ush Bot · ushbot, Ushahidi] [ushbot] [Ush Bot · ushbot, Ushahidi] [ushbot] [Ush Bot · ushbot, Ushahidi] [ushbot] [Ush Bot · ushbot, Ushahidi] [ushbot] [Ush Bot · ushbot, Ushahidi] [ushbot] [Ush Bot · ushbot, Ushahidi] [ushbot] [Ush Bot · ushbot, Ushahidi] [ushbot] [Will, Ushahidi] does that help? [Ush Bot · ushbot, Ushahidi] [ushbot] [Ush Bot · ushbot, Ushahidi] [ushbot] [Ush Bot · ushbot, Ushahidi] [ushbot] [Ush Bot · ushbot, Ushahidi] [ushbot] [Ush Bot · ushbot, Ushahidi] [ushbot] [Ush Bot · ushbot, Ushahidi] [ushbot] [Ush Bot · ushbot, Ushahidi] [ushbot] [Ush Bot · ushbot, Ushahidi] [ushbot] [Ush Bot · ushbot, Ushahidi] [ushbot] [Ush Bot · ushbot, Ushahidi] [ushbot] [Ush Bot · ushbot, Ushahidi] [ushbot] [Ush Bot · ushbot, Ushahidi] [ushbot] [Ush Bot · ushbot, Ushahidi] [ushbot] [Ush Bot · ushbot, Ushahidi] [ushbot] [Ush Bot · ushbot, Ushahidi] [ushbot] [Ush Bot · ushbot, Ushahidi] [ushbot] [Ush Bot · ushbot, Ushahidi] [ushbot] [Ush Bot · ushbot, Ushahidi] [ushbot] [Ush Bot · ushbot, Ushahidi] [ushbot] [Ush Bot · ushbot, Ushahidi] [ushbot] [Ush Bot · ushbot, Ushahidi] [ushbot] [Ush Bot · ushbot, Ushahidi] [ushbot] [Ush Bot · ushbot, Ushahidi] [ushbot] [Ush Bot · ushbot, Ushahidi] [ushbot] [Ush Bot · ushbot, Ushahidi] [ushbot] [Ush Bot · ushbot, Ushahidi] [ushbot] [Will, Ushahidi] does that help? [Ush Bot · ushbot, Ushahidi] [ushbot] [Ush Bot · ushbot, Ushahidi] [ushbot] [Ush Bot · ushbot, Ushahidi] [ushbot] [Ush Bot · ushbot, Ushahidi] [ushbot] [Ush Bot · ushbot, Ushahidi] [ushbot] [Ush Bot · ushbot, Ushahidi] [ushbot] [Ush Bot · ushbot, Ushahidi] [ushbot] [Ush Bot · ushbot, Ushahidi] [ushbot] [Ush Bot · ushbot, Ushahidi] [ushbot] [Ush Bot · ushbot, Ushahidi] [ushbot] [Ush Bot · ushbot, Ushahidi] [ushbot] [Ush Bot · ushbot, Ushahidi] [ushbot] [Ush Bot · ushbot, Ushahidi] [ushbot] [Ush Bot · ushbot, Ushahidi] [ushbot] [Ush Bot · ushbot, Ushahidi] [ushbot] [Ush Bot · ushbot, Ushahidi] [ushbot] [Ush Bot · ushbot, Ushahidi] [ushbot] [Ush Bot · ushbot, Ushahidi] [ushbot] [Ush Bot · ushbot, Ushahidi] [ushbot] [Ush Bot · ushbot, Ushahidi] [ushbot] [Ush Bot · ushbot, Ushahidi] [ushbot] [Ush Bot · ushbot, Ushahidi] [ushbot] [Ush Bot · ushbot, Ushahidi] [ushbot] [Ush Bot · ushbot, Ushahidi] [ushbot] [Ush Bot · ushbot, Ushahidi] [ushbot] [Ush Bot · ushbot, Ushahidi] [ushbot] [Ush Bot · ushbot, Ushahidi] [ushbot] [Will, Ushahidi] does that help? [Ush Bot · ushbot, Ushahidi] [ushbot] [Ush Bot · ushbot, Ushahidi] [ushbot] [Ush Bot · ushbot, Ushahidi] [ushbot] [Ush Bot · ushbot, Ushahidi] [ushbot] [Ush Bot · ushbot, Ushahidi] [ushbot] [Ush Bot · ushbot, Ushahidi] [ushbot] [Ush Bot · ushbot, Ushahidi] [ushbot] [Ush Bot · ushbot, Ushahidi] [ushbot] [Ush Bot · ushbot, Ushahidi] [ushbot] [Ush Bot · ushbot, Ushahidi] [ushbot] [Ush Bot · ushbot, Ushahidi] [ushbot] [Ush Bot · ushbot, Ushahidi] [ushbot] [Ush Bot · ushbot, Ushahidi] [ushbot] [Ush Bot · ushbot, Ushahidi] [ushbot] [Ush Bot · ushbot, Ushahidi] [ushbot] [Ush Bot · ushbot, Ushahidi] [ushbot] [Ush Bot · ushbot, Ushahidi] [ushbot] [Ush Bot · ushbot, Ushahidi] [ushbot] [Ush Bot · ushbot, Ushahidi] [ushbot] [Ush Bot · ushbot, Ushahidi] [ushbot] [Ush Bot · ushbot, Ushahidi] [ushbot] [Ush Bot · ushbot, Ushahidi] [ushbot] [Ush Bot · ushbot, Ushahidi] [ushbot] [Ush Bot · ushbot, Ushahidi] [ushbot] [Ush Bot · ushbot, Ushahidi] [ushbot] [Ush Bot · ushbot, Ushahidi] [ushbot] [Ush Bot · ushbot, Ushahidi] [ushbot] [Ush Bot · ushbot, Ushahidi] [ushbot] [Will, Ushahidi] does that help? [Ush Bot · ushbot, Ushahidi] [ushbot] [Ush Bot · ushbot, Ushahidi] [ushbot] [Ush Bot · ushbot, Ushahidi] [ushbot] [Ush Bot · ushbot, Ushahidi] [ushbot] [Ush Bot · ushbot, Ushahidi] [ushbot] [Ush Bot · ushbot, Ushahidi] [ushbot] [Ush Bot · ushbot, Ushahidi] [ushbot] [Ush Bot · ushbot, Ushahidi] [ushbot] [Ush Bot · ushbot, Ushahidi] [ushbot] [Ush Bot · ushbot, Ushahidi] [ushbot] [Ush Bot · ushbot, Ushahidi] [ushbot] [Ush Bot · ushbot, Ushahidi] [ushbot] [Ush Bot · ushbot, Ushahidi] [ushbot] [Ush Bot · ushbot, Ushahidi] [ushbot] [Ush Bot · ushbot, Ushahidi] [ushbot] [Ush Bot · ushbot, Ushahidi] [ushbot] [Ush Bot · ushbot, Ushahidi] [ushbot] [Ush Bot · ushbot, Ushahidi] [ushbot] [Ush Bot · ushbot, Ushahidi] [ushbot] [Ush Bot · ushbot, Ushahidi] [ushbot] [Ush Bot · ushbot, Ushahidi] [ushbot] [Ush Bot · ushbot, Ushahidi] [ushbot] [Ush Bot · ushbot, Ushahidi] [ushbot] [Ush Bot · ushbot, Ushahidi] [ushbot] [Ush Bot · ushbot, Ushahidi] [ushbot] [Ush Bot · ushbot, Ushahidi] [ushbot] [Ush Bot · ushbot, Ushahidi] [ushbot] [Ush Bot · ushbot, Ushahidi] [ushbot] [Ush Bot · ushbot, Ushahidi] [ushbot] [Will, Ushahidi] does that help? [Ush Bot · ushbot, Ushahidi] [ushbot] [Ush Bot · ushbot, Ushahidi] [ushbot] [Ush Bot · ushbot, Ushahidi] [ushbot] [Ush Bot · ushbot, Ushahidi] [ushbot] [Ush Bot · ushbot, Ushahidi] [ushbot] [Ush Bot · ushbot, Ushahidi] [ushbot] [Ush Bot · ushbot, Ushahidi] [ushbot] [Ush Bot · ushbot, Ushahidi] [ushbot] [Ush Bot · ushbot, Ushahidi] [ushbot] [Ush Bot · ushbot, Ushahidi] [ushbot] [Ush Bot · ushbot, Ushahidi] [ushbot] [Ush Bot · ushbot, Ushahidi] [ushbot] [Ush Bot · ushbot, Ushahidi] [ushbot] [Ush Bot · ushbot, Ushahidi] [ushbot] [Ush Bot · ushbot, Ushahidi] [ushbot] [Ush Bot · ushbot, Ushahidi] [ushbot] [Ush Bot · ushbot, Ushahidi] [ushbot] [Ush Bot · ushbot, Ushahidi] [ushbot] [Ush Bot · ushbot, Ushahidi] [ushbot] [Ush Bot · ushbot, Ushahidi] [ushbot] [Ush Bot · ushbot, Ushahidi] [ushbot] [Ush Bot · ushbot, Ushahidi] [ushbot] [Ush Bot · ushbot, Ushahidi] [ushbot] [Ush Bot · ushbot, Ushahidi] [ushbot] [Ush Bot · ushbot, Ushahidi] [ushbot] [Ush Bot · ushbot, Ushahidi] [ushbot] [Ush Bot · ushbot, Ushahidi] [ushbot] [Ush Bot · ushbot, Ushahidi] [ushbot] [Ush Bot · ushbot, Ushahidi] [ushbot] [Ush Bot · ushbot, Ushahidi] [ushbot] [Will, Ushahidi] does that help? [Ush Bot · ushbot, Ushahidi] [ushbot] [Ush Bot · ushbot, Ushahidi] [ushbot] [Ush Bot · ushbot, Ushahidi] [ushbot] [Ush Bot · ushbot, Ushahidi] [ushbot] [Ush Bot · ushbot, Ushahidi] [ushbot] [Ush Bot · ushbot, Ushahidi] [ushbot] [Ush Bot · ushbot, Ushahidi] [ushbot] [Ush Bot · ushbot, Ushahidi] [ushbot] [Ush Bot · ushbot, Ushahidi] [ushbot] [Ush Bot · ushbot, Ushahidi] [ushbot] [Ush Bot · ushbot, Ushahidi] [ushbot] [Ush Bot · ushbot, Ushahidi] [ushbot] [Ush Bot · ushbot, Ushahidi] [ushbot] [Ush Bot · ushbot, Ushahidi] [ushbot] [Ush Bot · ushbot, Ushahidi] [ushbot] [Ush Bot · ushbot, Ushahidi] [ushbot] [Ush Bot · ushbot, Ushahidi] [ushbot] [Ush Bot · ushbot, Ushahidi] [ushbot] [Ush Bot · ushbot, Ushahidi] [ushbot] [Ush Bot · ushbot, Ushahidi] [ushbot] [Ush Bot · ushbot, Ushahidi] [ushbot] [Ush Bot · ushbot, Ushahidi] [ushbot] [Ush Bot · ushbot, Ushahidi] [ushbot] [Ush Bot · ushbot, Ushahidi] [ushbot] [Ush Bot · ushbot, Ushahidi] [ushbot] [Ush Bot · ushbot, Ushahidi] [ushbot] [Ush Bot · ushbot, Ushahidi] [ushbot] [Ush Bot · ushbot, Ushahidi] [ushbot] [Ush Bot · ushbot, Ushahidi] [ushbot] [Ush Bot · ushbot, Ushahidi] [ushbot] [Ush Bot · ushbot, Ushahidi] [ushbot] [Will, Ushahidi] does that help? [Ush Bot · ushbot, Ushahidi] [ushbot] [Ush Bot · ushbot, Ushahidi] [ushbot] [Ush Bot · ushbot, Ushahidi] [ushbot] [Ush Bot · ushbot, Ushahidi] [ushbot] [Ush Bot · ushbot, Ushahidi] [ushbot] [Ush Bot · ushbot, Ushahidi] [ushbot] [Ush Bot · ushbot, Ushahidi] [ushbot] [Ush Bot · ushbot, Ushahidi] [ushbot] [Ush Bot · ushbot, Ushahidi] [ushbot] [Ush Bot · ushbot, Ushahidi] [ushbot] [Ush Bot · ushbot, Ushahidi] [ushbot] [Ush Bot · ushbot, Ushahidi] [ushbot] [Ush Bot · ushbot, Ushahidi] [ushbot] [Ush Bot · ushbot, Ushahidi] [ushbot] [Ush Bot · ushbot, Ushahidi] [ushbot] [Ush Bot · ushbot, Ushahidi] [ushbot] [Ush Bot · ushbot, Ushahidi] [ushbot] [Ush Bot · ushbot, Ushahidi] [ushbot] [Ush Bot · ushbot, Ushahidi] [ushbot] [Ush Bot · ushbot, Ushahidi] [ushbot] [Ush Bot · ushbot, Ushahidi] [ushbot] [Ush Bot · ushbot, Ushahidi] [ushbot] [Ush Bot · ushbot, Ushahidi] [ushbot] [Ush Bot · ushbot, Ushahidi] [ushbot] [Ush Bot · ushbot, Ushahidi] [ushbot] [Ush Bot · ushbot, Ushahidi] [ushbot] [Ush Bot · ushbot, Ushahidi] [ushbot] [Ush Bot · ushbot, Ushahidi] [ushbot] [Ush Bot · ushbot, Ushahidi] [ushbot] [Ush Bot · ushbot, Ushahidi] [ushbot] [Ush Bot · ushbot, Ushahidi] [ushbot] [Ush Bot · ushbot, Ushahidi] [ushbot] [Will, Ushahidi] does that help? [Ush Bot · ushbot, Ushahidi] [ushbot] [Ush Bot · ushbot, Ushahidi] [ushbot] [Ush Bot · ushbot, Ushahidi] [ushbot] [Ush Bot · ushbot, Ushahidi] [ushbot] [Ush Bot · ushbot, Ushahidi] [ushbot] [Ush Bot · ushbot, Ushahidi] [ushbot] [Ush Bot · ushbot, Ushahidi] [ushbot] [Ush Bot · ushbot, Ushahidi] [ushbot] [Ush Bot · ushbot, Ushahidi] [ushbot] [Ush Bot · ushbot, Ushahidi] [ushbot] [Ush Bot · ushbot, Ushahidi] [ushbot] [Ush Bot · ushbot, Ushahidi] [ushbot] [Ush Bot · ushbot, Ushahidi] [ushbot] [Ush Bot · ushbot, Ushahidi] [ushbot] [Ush Bot · ushbot, Ushahidi] [ushbot] [Ush Bot · ushbot, Ushahidi] [ushbot] [Ush Bot · ushbot, Ushahidi] [ushbot] [Ush Bot · ushbot, Ushahidi] [ushbot] [Ush Bot · ushbot, Ushahidi] [ushbot] [Ush Bot · ushbot, Ushahidi] [ushbot] [Ush Bot · ushbot, Ushahidi] [ushbot] [Ush Bot · ushbot, Ushahidi] [ushbot] [Ush Bot · ushbot, Ushahidi] [ushbot] [Ush Bot · ushbot, Ushahidi] [ushbot] [Ush Bot · ushbot, Ushahidi] [ushbot] [Ush Bot · ushbot, Ushahidi] [ushbot] [Ush Bot · ushbot, Ushahidi] [ushbot] [Ush Bot · ushbot, Ushahidi] [ushbot] [Ush Bot · ushbot, Ushahidi] [ushbot] [Ush Bot · ushbot, Ushahidi] [ushbot] [Ush Bot · ushbot, Ushahidi] [ushbot] [Ush Bot · ushbot, Ushahidi] [ushbot] [Ush Bot · ushbot, Ushahidi] [ushbot] [Will, Ushahidi] does that help? [Ush Bot · ushbot, Ushahidi] [ushbot] [Ush Bot · ushbot, Ushahidi] [ushbot] [Ush Bot · ushbot, Ushahidi] [ushbot] [Ush Bot · ushbot, Ushahidi] [ushbot] [Ush Bot · ushbot, Ushahidi] [ushbot] [Ush Bot · ushbot, Ushahidi] [ushbot] [Ush Bot · ushbot, Ushahidi] [ushbot] [Ush Bot · ushbot, Ushahidi] [ushbot] [Ush Bot · ushbot, Ushahidi] [ushbot] [Ush Bot · ushbot, Ushahidi] [ushbot] [Ush Bot · ushbot, Ushahidi] [ushbot] [Ush Bot · ushbot, Ushahidi] [ushbot] [Ush Bot · ushbot, Ushahidi] [ushbot] [Ush Bot · ushbot, Ushahidi] [ushbot] [Ush Bot · ushbot, Ushahidi] [ushbot] [Ush Bot · ushbot, Ushahidi] [ushbot] [Ush Bot · ushbot, Ushahidi] [ushbot] [Ush Bot · ushbot, Ushahidi] [ushbot] [Ush Bot · ushbot, Ushahidi] [ushbot] [Ush Bot · ushbot, Ushahidi] [ushbot] [Ush Bot · ushbot, Ushahidi] [ushbot] [Ush Bot · ushbot, Ushahidi] [ushbot] [Ush Bot · ushbot, Ushahidi] [ushbot] [Ush Bot · ushbot, Ushahidi] [ushbot] [Ush Bot · ushbot, Ushahidi] [ushbot] [Ush Bot · ushbot, Ushahidi] [ushbot] [Ush Bot · ushbot, Ushahidi] [ushbot] [Ush Bot · ushbot, Ushahidi] [ushbot] [Ush Bot · ushbot, Ushahidi] [ushbot] [Ush Bot · ushbot, Ushahidi] [ushbot] [Ush Bot · ushbot, Ushahidi] [ushbot] [Ush Bot · ushbot, Ushahidi] [ushbot] [Ush Bot · ushbot, Ushahidi] [ushbot] [Ush Bot · ushbot, Ushahidi] [ushbot] [Will, Ushahidi] does that help? [Ush Bot · ushbot, Ushahidi] [ushbot] [Ush Bot · ushbot, Ushahidi] [ushbot] [Ush Bot · ushbot, Ushahidi] [ushbot] [Ush Bot · ushbot, Ushahidi] [ushbot] [Ush Bot · ushbot, Ushahidi] [ushbot] [Ush Bot · ushbot, Ushahidi] [ushbot] [Ush Bot · ushbot, Ushahidi] [ushbot] [Ush Bot · ushbot, Ushahidi] [ushbot] [Ush Bot · ushbot, Ushahidi] [ushbot] [Ush Bot · ushbot, Ushahidi] [ushbot] [Ush Bot · ushbot, Ushahidi] [ushbot] [Ush Bot · ushbot, Ushahidi] [ushbot] [Ush Bot · ushbot, Ushahidi] [ushbot] [Ush Bot · ushbot, Ushahidi] [ushbot] [Ush Bot · ushbot, Ushahidi] [ushbot] [Ush Bot · ushbot, Ushahidi] [ushbot] [Ush Bot · ushbot, Ushahidi] [ushbot] [Ush Bot · ushbot, Ushahidi] [ushbot] [Ush Bot · ushbot, Ushahidi] [ushbot] [Ush Bot · ushbot, Ushahidi] [ushbot] [Ush Bot · ushbot, Ushahidi] [ushbot] [Ush Bot · ushbot, Ushahidi] [ushbot] [Ush Bot · ushbot, Ushahidi] [ushbot] [Ush Bot · ushbot, Ushahidi] [ushbot] [Ush Bot · ushbot, Ushahidi] [ushbot] [Ush Bot · ushbot, Ushahidi] [ushbot] [Ush Bot · ushbot, Ushahidi] [ushbot] [Ush Bot · ushbot, Ushahidi] [ushbot] [Ush Bot · ushbot, Ushahidi] [ushbot] [Ush Bot · ushbot, Ushahidi] [ushbot] [Ush Bot · ushbot, Ushahidi] [ushbot] [Ush Bot · ushbot, Ushahidi] [ushbot] [Ush Bot · ushbot, Ushahidi] [ushbot] [Ush Bot · ushbot, Ushahidi] [ushbot] [Ush Bot · ushbot, Ushahidi] [ushbot] [Will, Ushahidi] does that help? [Ush Bot · ushbot, Ushahidi] [ushbot] [Ush Bot · ushbot, Ushahidi] [ushbot] [Ush Bot · ushbot, Ushahidi] [ushbot] [Ush Bot · ushbot, Ushahidi] [ushbot] [Ush Bot · ushbot, Ushahidi] [ushbot] [Ush Bot · ushbot, Ushahidi] [ushbot] [Ush Bot · ushbot, Ushahidi] [ushbot] [Ush Bot · ushbot, Ushahidi] [ushbot] [Ush Bot · ushbot, Ushahidi] [ushbot] [Ush Bot · ushbot, Ushahidi] [ushbot] [Ush Bot · ushbot, Ushahidi] [ushbot] [Ush Bot · ushbot, Ushahidi] [ushbot] [Ush Bot · ushbot, Ushahidi] [ushbot] [Ush Bot · ushbot, Ushahidi] [ushbot] [Ush Bot · ushbot, Ushahidi] [ushbot] [Ush Bot · ushbot, Ushahidi] [ushbot] [Ush Bot · ushbot, Ushahidi] [ushbot] [Ush Bot · ushbot, Ushahidi] [ushbot] [Ush Bot · ushbot, Ushahidi] [ushbot] [Ush Bot · ushbot, Ushahidi] [ushbot] [Ush Bot · ushbot, Ushahidi] [ushbot] [Ush Bot · ushbot, Ushahidi] [ushbot] [Ush Bot · ushbot, Ushahidi] [ushbot] [Ush Bot · ushbot, Ushahidi] [ushbot] [Ush Bot · ushbot, Ushahidi] [ushbot] [Ush Bot · ushbot, Ushahidi] [ushbot] [Ush Bot · ushbot, Ushahidi] [ushbot] [Ush Bot · ushbot, Ushahidi] [ushbot] [Ush Bot · ushbot, Ushahidi] [ushbot] [Ush Bot · ushbot, Ushahidi] [ushbot] [Ush Bot · ushbot, Ushahidi] [ushbot] [Ush Bot · ushbot, Ushahidi] [ushbot] [Ush Bot · ushbot, Ushahidi] [ushbot] [Ush Bot · ushbot, Ushahidi] [ushbot] [Ush Bot · ushbot, Ushahidi] [ushbot] [Ush Bot · ushbot, Ushahidi] [ushbot] [Will, Ushahidi] does that help? [Ush Bot · ushbot, Ushahidi] [ushbot] [Ush Bot · ushbot, Ushahidi] [ushbot] [Ush Bot · ushbot, Ushahidi] [ushbot] [Ush Bot · ushbot, Ushahidi] [ushbot] [Ush Bot · ushbot, Ushahidi] [ushbot] [Ush Bot · ushbot, Ushahidi] [ushbot] [Ush Bot · ushbot, Ushahidi] [ushbot] [Ush Bot · ushbot, Ushahidi] [ushbot] [Ush Bot · ushbot, Ushahidi] [ushbot] [Ush Bot · ushbot, Ushahidi] [ushbot] [Ush Bot · ushbot, Ushahidi] [ushbot] [Ush Bot · ushbot, Ushahidi] [ushbot] [Ush Bot · ushbot, Ushahidi] [ushbot] [Ush Bot · ushbot, Ushahidi] [ushbot] [Ush Bot · ushbot, Ushahidi] [ushbot] [Ush Bot · ushbot, Ushahidi] [ushbot] [Ush Bot · ushbot, Ushahidi] [ushbot] [Ush Bot · ushbot, Ushahidi] [ushbot] [Ush Bot · ushbot, Ushahidi] [ushbot] [Ush Bot · ushbot, Ushahidi] [ushbot] [Ush Bot · ushbot, Ushahidi] [ushbot] [Ush Bot · ushbot, Ushahidi] [ushbot] [Ush Bot · ushbot, Ushahidi] [ushbot] [Ush Bot · ushbot, Ushahidi] [ushbot] [Ush Bot · ushbot, Ushahidi] [ushbot] [Ush Bot · ushbot, Ushahidi] [ushbot] [Ush Bot · ushbot, Ushahidi] [ushbot] [Ush Bot · ushbot, Ushahidi] [ushbot] [Ush Bot · ushbot, Ushahidi] [ushbot] [Ush Bot · ushbot, Ushahidi] [ushbot] [Ush Bot · ushbot, Ushahidi] [ushbot] [Ush Bot · ushbot, Ushahidi] [ushbot] [Ush Bot · ushbot, Ushahidi] [ushbot] [Ush Bot · ushbot, Ushahidi] [ushbot] [Ush Bot · ushbot, Ushahidi] [ushbot] [Ush Bot · ushbot, Ushahidi] [ushbot] [Ush Bot · ushbot, Ushahidi] [ushbot] [Will, Ushahidi] does that help? [Ush Bot · ushbot, Ushahidi] [ushbot] [Ush Bot · ushbot, Ushahidi] [ushbot] [Ush Bot · ushbot, Ushahidi] [ushbot] [Ush Bot · ushbot, Ushahidi] [ushbot] [Ush Bot · ushbot, Ushahidi] [ushbot] [Ush Bot · ushbot, Ushahidi] [ushbot] [Ush Bot · ushbot, Ushahidi] [ushbot] [Ush Bot · ushbot, Ushahidi] [ushbot] [Ush Bot · ushbot, Ushahidi] [ushbot] [Ush Bot · ushbot, Ushahidi] [ushbot] [Ush Bot · ushbot, Ushahidi] [ushbot] [Ush Bot · ushbot, Ushahidi] [ushbot] [Ush Bot · ushbot, Ushahidi] [ushbot] [Ush Bot · ushbot, Ushahidi] [ushbot] [Ush Bot · ushbot, Ushahidi] [ushbot] [Ush Bot · ushbot, Ushahidi] [ushbot] [Ush Bot · ushbot, Ushahidi] [ushbot] [Ush Bot · ushbot, Ushahidi] [ushbot] [Ush Bot · ushbot, Ushahidi] [ushbot] [Ush Bot · ushbot, Ushahidi] [ushbot] [Ush Bot · ushbot, Ushahidi] [ushbot] [Ush Bot · ushbot, Ushahidi] [ushbot] [Ush Bot · ushbot, Ushahidi] [ushbot] [Ush Bot · ushbot, Ushahidi] [ushbot] [Ush Bot · ushbot, Ushahidi] [ushbot] [Ush Bot · ushbot, Ushahidi] [ushbot] [Ush Bot · ushbot, Ushahidi] [ushbot] [Ush Bot · ushbot, Ushahidi] [ushbot] [Ush Bot · ushbot, Ushahidi] [ushbot] [Ush Bot · ushbot, Ushahidi] [ushbot] [Ush Bot · ushbot, Ushahidi] [ushbot] [Ush Bot · ushbot, Ushahidi] [ushbot] [Ush Bot · ushbot, Ushahidi] [ushbot] [Ush Bot · ushbot, Ushahidi] [ushbot] [Ush Bot · ushbot, Ushahidi] [ushbot] [Ush Bot · ushbot, Ushahidi] [ushbot] [Ush Bot · ushbot, Ushahidi] [ushbot] [Ush Bot · ushbot, Ushahidi] [ushbot] [Will, Ushahidi] does that help? [Ush Bot · ushbot, Ushahidi] [ushbot] [Ush Bot · ushbot, Ushahidi] [ushbot] [Ush Bot · ushbot, Ushahidi] [ushbot] [Ush Bot · ushbot, Ushahidi] [ushbot] [Ush Bot · ushbot, Ushahidi] [ushbot] [Ush Bot · ushbot, Ushahidi] [ushbot] [Ush Bot · ushbot, Ushahidi] [ushbot] [Ush Bot · ushbot, Ushahidi] [ushbot] [Ush Bot · ushbot, Ushahidi] [ushbot] [Ush Bot · ushbot, Ushahidi] [ushbot] [Ush Bot · ushbot, Ushahidi] [ushbot] [Ush Bot · ushbot, Ushahidi] [ushbot] [Ush Bot · ushbot, Ushahidi] [ushbot] [Ush Bot · ushbot, Ushahidi] [ushbot] [Ush Bot · ushbot, Ushahidi] [ushbot] [Ush Bot · ushbot, Ushahidi] [ushbot] [Ush Bot · ushbot, Ushahidi] [ushbot] [Ush Bot · ushbot, Ushahidi] [ushbot] [Ush Bot · ushbot, Ushahidi] [ushbot] [Ush Bot · ushbot, Ushahidi] [ushbot] [Ush Bot · ushbot, Ushahidi] [ushbot] [Ush Bot · ushbot, Ushahidi] [ushbot] [Ush Bot · ushbot, Ushahidi] [ushbot] [Ush Bot · ushbot, Ushahidi] [ushbot] [Ush Bot · ushbot, Ushahidi] [ushbot] [Ush Bot · ushbot, Ushahidi] [ushbot] [Ush Bot · ushbot, Ushahidi] [ushbot] [Ush Bot · ushbot, Ushahidi] [ushbot] [Ush Bot · ushbot, Ushahidi] [ushbot] [Ush Bot · ushbot, Ushahidi] [ushbot] [Ush Bot · ushbot, Ushahidi] [ushbot] [Ush Bot · ushbot, Ushahidi] [ushbot] [Ush Bot · ushbot, Ushahidi] [ushbot] [Ush Bot · ushbot, Ushahidi] [ushbot] [Ush Bot · ushbot, Ushahidi] [ushbot] [Ush Bot · ushbot, Ushahidi] [ushbot] [Ush Bot · ushbot, Ushahidi] [ushbot] [Ush Bot · ushbot, Ushahidi] [ushbot] [Ush Bot · ushbot, Ushahidi] [ushbot] [Will, Ushahidi] does that help? [Ush Bot · ushbot, Ushahidi] [ushbot] [Ush Bot · ushbot, Ushahidi] [ushbot] [Ush Bot · ushbot, Ushahidi] [ushbot] [Ush Bot · ushbot, Ushahidi] [ushbot] [Ush Bot · ushbot, Ushahidi] [ushbot] [Ush Bot · ushbot, Ushahidi] [ushbot] [Ush Bot · ushbot, Ushahidi] [ushbot] [Ush Bot · ushbot, Ushahidi] [ushbot] [Ush Bot · ushbot, Ushahidi] [ushbot] [Ush Bot · ushbot, Ushahidi] [ushbot] [Ush Bot · ushbot, Ushahidi] [ushbot] [Ush Bot · ushbot, Ushahidi] [ushbot] [Ush Bot · ushbot, Ushahidi] [ushbot] [Ush Bot · ushbot, Ushahidi] [ushbot] [Ush Bot · ushbot, Ushahidi] [ushbot] [Ush Bot · ushbot, Ushahidi] [ushbot] [Ush Bot · ushbot, Ushahidi] [ushbot] [Ush Bot · ushbot, Ushahidi] [ushbot] [Ush Bot · ushbot, Ushahidi] [ushbot] [Ush Bot · ushbot, Ushahidi] [ushbot] [Ush Bot · ushbot, Ushahidi] [ushbot] [Ush Bot · ushbot, Ushahidi] [ushbot] [Ush Bot · ushbot, Ushahidi] [ushbot] [Ush Bot · ushbot, Ushahidi] [ushbot] [Ush Bot · ushbot, Ushahidi] [ushbot] [Ush Bot · ushbot, Ushahidi] [ushbot] [Ush Bot · ushbot, Ushahidi] [ushbot] [Ush Bot · ushbot, Ushahidi] [ushbot] [Ush Bot · ushbot, Ushahidi] [ushbot] [Ush Bot · ushbot, Ushahidi] [ushbot] [Ush Bot · ushbot, Ushahidi] [ushbot] [Ush Bot · ushbot, Ushahidi] [ushbot] [Ush Bot · ushbot, Ushahidi] [ushbot] [Ush Bot · ushbot, Ushahidi] [ushbot] [Ush Bot · ushbot, Ushahidi] [ushbot] [Ush Bot · ushbot, Ushahidi] [ushbot] [Ush Bot · ushbot, Ushahidi] [ushbot] [Ush Bot · ushbot, Ushahidi] [ushbot] [Ush Bot · ushbot, Ushahidi] [ushbot] [Ush Bot · ushbot, Ushahidi] [ushbot] [Will, Ushahidi] does that help? [Ush Bot · ushbot, Ushahidi] [ushbot] [Ush Bot · ushbot, Ushahidi] [ushbot] [Ush Bot · ushbot, Ushahidi] [ushbot] [Ush Bot · ushbot, Ushahidi] [ushbot] [Ush Bot · ushbot, Ushahidi] [ushbot] [Ush Bot · ushbot, Ushahidi] [ushbot] [Ush Bot · ushbot, Ushahidi] [ushbot] [Ush Bot · ushbot, Ushahidi] [ushbot] [Ush Bot · ushbot, Ushahidi] [ushbot] [Ush Bot · ushbot, Ushahidi] [ushbot] [Ush Bot · ushbot, Ushahidi] [ushbot] [Ush Bot · ushbot, Ushahidi] [ushbot] [Ush Bot · ushbot, Ushahidi] [ushbot] [Ush Bot · ushbot, Ushahidi] [ushbot] [Ush Bot · ushbot, Ushahidi] [ushbot] [Ush Bot · ushbot, Ushahidi] [ushbot] [Ush Bot · ushbot, Ushahidi] [ushbot] [Ush Bot · ushbot, Ushahidi] [ushbot] [Ush Bot · ushbot, Ushahidi] [ushbot] [Ush Bot · ushbot, Ushahidi] [ushbot] [Ush Bot · ushbot, Ushahidi] [ushbot] [Ush Bot · ushbot, Ushahidi] [ushbot] [Ush Bot · ushbot, Ushahidi] [ushbot] [Ush Bot · ushbot, Ushahidi] [ushbot] [Ush Bot · ushbot, Ushahidi] [ushbot] [Ush Bot · ushbot, Ushahidi] [ushbot] [Ush Bot · ushbot, Ushahidi] [ushbot] [Ush Bot · ushbot, Ushahidi] [ushbot] [Ush Bot · ushbot, Ushahidi] [ushbot] [Ush Bot · ushbot, Ushahidi] [ushbot] [Ush Bot · ushbot, Ushahidi] [ushbot] [Ush Bot · ushbot, Ushahidi] [ushbot] [Ush Bot · ushbot, Ushahidi] [ushbot] [Ush Bot · ushbot, Ushahidi] [ushbot] [Ush Bot · ushbot, Ushahidi] [ushbot] [Ush Bot · ushbot, Ushahidi] [ushbot] [Ush Bot · ushbot, Ushahidi] [ushbot] [Ush Bot · ushbot, Ushahidi] [ushbot] [Ush Bot · ushbot, Ushahidi] [ushbot] [Ush Bot · ushbot, Ushahidi] [ushbot] [Ush Bot · ushbot, Ushahidi] [ushbot] [Will, Ushahidi] does that help? [Ush Bot · ushbot, Ushahidi] [ushbot] [Ush Bot · ushbot, Ushahidi] [ushbot] [Ush Bot · ushbot, Ushahidi] [ushbot] [Ush Bot · ushbot, Ushahidi] [ushbot] [Ush Bot · ushbot, Ushahidi] [ushbot] [Ush Bot · ushbot, Ushahidi] [ushbot] [Ush Bot · ushbot, Ushahidi] [ushbot] [Ush Bot · ushbot, Ushahidi] [ushbot] [Ush Bot · ushbot, Ushahidi] [ushbot] [Ush Bot · ushbot, Ushahidi] [ushbot] [Ush Bot · ushbot, Ushahidi] [ushbot] [Ush Bot · ushbot, Ushahidi] [ushbot] [Ush Bot · ushbot, Ushahidi] [ushbot] [Ush Bot · ushbot, Ushahidi] [ushbot] [Ush Bot · ushbot, Ushahidi] [ushbot] [Ush Bot · ushbot, Ushahidi] [ushbot] [Ush Bot · ushbot, Ushahidi] [ushbot] [Ush Bot · ushbot, Ushahidi] [ushbot] [Ush Bot · ushbot, Ushahidi] [ushbot] [Ush Bot · ushbot, Ushahidi] [ushbot] [Ush Bot · ushbot, Ushahidi] [ushbot] [Ush Bot · ushbot, Ushahidi] [ushbot] [Ush Bot · ushbot, Ushahidi] [ushbot] [Ush Bot · ushbot, Ushahidi] [ushbot] [Ush Bot · ushbot, Ushahidi] [ushbot] [Ush Bot · ushbot, Ushahidi] [ushbot] [Ush Bot · ushbot, Ushahidi] [ushbot] [Ush Bot · ushbot, Ushahidi] [ushbot] [Ush Bot · ushbot, Ushahidi] [ushbot] [Ush Bot · ushbot, Ushahidi] [ushbot] [Ush Bot · ushbot, Ushahidi] [ushbot] [Ush Bot · ushbot, Ushahidi] [ushbot] [Ush Bot · ushbot, Ushahidi] [ushbot] [Ush Bot · ushbot, Ushahidi] [ushbot] [Ush Bot · ushbot, Ushahidi] [ushbot] [Ush Bot · ushbot, Ushahidi] [ushbot] [Ush Bot · ushbot, Ushahidi] [ushbot] [Ush Bot · ushbot, Ushahidi] [ushbot] [Ush Bot · ushbot, Ushahidi] [ushbot] [Ush Bot · ushbot, Ushahidi] [ushbot] [Ush Bot · ushbot, Ushahidi] [ushbot] [Ush Bot · ushbot, Ushahidi] [ushbot] [Will, Ushahidi] does that help? [Ush Bot · ushbot, Ushahidi] [ushbot] [Ush Bot · ushbot, Ushahidi] [ushbot] [Ush Bot · ushbot, Ushahidi] [ushbot] [Ush Bot · ushbot, Ushahidi] [ushbot] [Ush Bot · ushbot, Ushahidi] [ushbot] [Ush Bot · ushbot, Ushahidi] [ushbot] [Ush Bot · ushbot, Ushahidi] [ushbot] [Ush Bot · ushbot, Ushahidi] [ushbot] [Ush Bot · ushbot, Ushahidi] [ushbot] [Ush Bot · ushbot, Ushahidi] [ushbot] [Ush Bot · ushbot, Ushahidi] [ushbot] [Ush Bot · ushbot, Ushahidi] [ushbot] [Ush Bot · ushbot, Ushahidi] [ushbot] [Ush Bot · ushbot, Ushahidi] [ushbot] [Ush Bot · ushbot, Ushahidi] [ushbot] [Ush Bot · ushbot, Ushahidi] [ushbot] [Ush Bot · ushbot, Ushahidi] [ushbot] [Ush Bot · ushbot, Ushahidi] [ushbot] [Ush Bot · ushbot, Ushahidi] [ushbot] [Ush Bot · ushbot, Ushahidi] [ushbot] [Ush Bot · ushbot, Ushahidi] [ushbot] [Ush Bot · ushbot, Ushahidi] [ushbot] [Ush Bot · ushbot, Ushahidi] [ushbot] [Ush Bot · ushbot, Ushahidi] [ushbot] [Ush Bot · ushbot, Ushahidi] [ushbot] [Ush Bot · ushbot, Ushahidi] [ushbot] [Ush Bot · ushbot, Ushahidi] [ushbot] [Ush Bot · ushbot, Ushahidi] [ushbot] [Ush Bot · ushbot, Ushahidi] [ushbot] [Ush Bot · ushbot, Ushahidi] [ushbot] [Ush Bot · ushbot, Ushahidi] [ushbot] [Ush Bot · ushbot, Ushahidi] [ushbot] [Ush Bot · ushbot, Ushahidi] [ushbot] [Ush Bot · ushbot, Ushahidi] [ushbot] [Ush Bot · ushbot, Ushahidi] [ushbot] [Ush Bot · ushbot, Ushahidi] [ushbot] [Ush Bot · ushbot, Ushahidi] [ushbot] [Ush Bot · ushbot, Ushahidi] [ushbot] [Ush Bot · ushbot, Ushahidi] [ushbot] [Ush Bot · ushbot, Ushahidi] [ushbot] [Ush Bot · ushbot, Ushahidi] [ushbot] [Ush Bot · ushbot, Ushahidi] [ushbot] [Ush Bot · ushbot, Ushahidi] [ushbot] [Will, Ushahidi] does that help? [Ush Bot · ushbot, Ushahidi] [ushbot] [Ush Bot · ushbot, Ushahidi] [ushbot] [Ush Bot · ushbot, Ushahidi] [ushbot] [Ush Bot · ushbot, Ushahidi] [ushbot] [Ush Bot · ushbot, Ushahidi] [ushbot] [Ush Bot · ushbot, Ushahidi] [ushbot] [Ush Bot · ushbot, Ushahidi] [ushbot] [Ush Bot · ushbot, Ushahidi] [ushbot] [Ush Bot · ushbot, Ushahidi] [ushbot] [Ush Bot · ushbot, Ushahidi] [ushbot] [Ush Bot · ushbot, Ushahidi] [ushbot] [Ush Bot · ushbot, Ushahidi] [ushbot] [Ush Bot · ushbot, Ushahidi] [ushbot] [Ush Bot · ushbot, Ushahidi] [ushbot] [Ush Bot · ushbot, Ushahidi] [ushbot] [Ush Bot · ushbot, Ushahidi] [ushbot] [Ush Bot · ushbot, Ushahidi] [ushbot] [Ush Bot · ushbot, Ushahidi] [ushbot] [Ush Bot · ushbot, Ushahidi] [ushbot] [Ush Bot · ushbot, Ushahidi] [ushbot] [Ush Bot · ushbot, Ushahidi] [ushbot] [Ush Bot · ushbot, Ushahidi] [ushbot] [Ush Bot · ushbot, Ushahidi] [ushbot] [Ush Bot · ushbot, Ushahidi] [ushbot] [Ush Bot · ushbot, Ushahidi] [ushbot] [Ush Bot · ushbot, Ushahidi] [ushbot] [Ush Bot · ushbot, Ushahidi] [ushbot] [Ush Bot · ushbot, Ushahidi] [ushbot] [Ush Bot · ushbot, Ushahidi] [ushbot] [Ush Bot · ushbot, Ushahidi] [ushbot] [Ush Bot · ushbot, Ushahidi] [ushbot] [Ush Bot · ushbot, Ushahidi] [ushbot] [Ush Bot · ushbot, Ushahidi] [ushbot] [Ush Bot · ushbot, Ushahidi] [ushbot] [Ush Bot · ushbot, Ushahidi] [ushbot] [Ush Bot · ushbot, Ushahidi] [ushbot] [Ush Bot · ushbot, Ushahidi] [ushbot] [Ush Bot · ushbot, Ushahidi] [ushbot] [Ush Bot · ushbot, Ushahidi] [ushbot] [Ush Bot · ushbot, Ushahidi] [ushbot] [Ush Bot · ushbot, Ushahidi] [ushbot] [Ush Bot · ushbot, Ushahidi] [ushbot] [Ush Bot · ushbot, Ushahidi] [ushbot] [Ush Bot · ushbot, Ushahidi] [ushbot] [Will, Ushahidi] does that help? [Ush Bot · ushbot, Ushahidi] [ushbot] [Ush Bot · ushbot, Ushahidi] [ushbot] [Ush Bot · ushbot, Ushahidi] [ushbot] [Ush Bot · ushbot, Ushahidi] [ushbot] [Ush Bot · ushbot, Ushahidi] [ushbot] [Ush Bot · ushbot, Ushahidi] [ushbot] [Ush Bot · ushbot, Ushahidi] [ushbot] [Ush Bot · ushbot, Ushahidi] [ushbot] [Ush Bot · ushbot, Ushahidi] [ushbot] [Ush Bot · ushbot, Ushahidi] [ushbot] [Ush Bot · ushbot, Ushahidi] [ushbot] [Ush Bot · ushbot, Ushahidi] [ushbot] [Ush Bot · ushbot, Ushahidi] [ushbot] [Ush Bot · ushbot, Ushahidi] [ushbot] [Ush Bot · ushbot, Ushahidi] [ushbot] [Ush Bot · ushbot, Ushahidi] [ushbot] [Ush Bot · ushbot, Ushahidi] [ushbot] [Ush Bot · ushbot, Ushahidi] [ushbot] [Ush Bot · ushbot, Ushahidi] [ushbot] [Ush Bot · ushbot, Ushahidi] [ushbot] [Ush Bot · ushbot, Ushahidi] [ushbot] [Ush Bot · ushbot, Ushahidi] [ushbot] [Ush Bot · ushbot, Ushahidi] [ushbot] [Ush Bot · ushbot, Ushahidi] [ushbot] [Ush Bot · ushbot, Ushahidi] [ushbot] [Ush Bot · ushbot, Ushahidi] [ushbot] [Ush Bot · ushbot, Ushahidi] [ushbot] [Ush Bot · ushbot, Ushahidi] [ushbot] [Ush Bot · ushbot, Ushahidi] [ushbot] [Ush Bot · ushbot, Ushahidi] [ushbot] [Ush Bot · ushbot, Ushahidi] [ushbot] [Ush Bot · ushbot, Ushahidi] [ushbot] [Ush Bot · ushbot, Ushahidi] [ushbot] [Ush Bot · ushbot, Ushahidi] [ushbot] [Ush Bot · ushbot, Ushahidi] [ushbot] [Ush Bot · ushbot, Ushahidi] [ushbot] [Ush Bot · ushbot, Ushahidi] [ushbot] [Ush Bot · ushbot, Ushahidi] [ushbot] [Ush Bot · ushbot, Ushahidi] [ushbot] [Ush Bot · ushbot, Ushahidi] [ushbot] [Ush Bot · ushbot, Ushahidi] [ushbot] [Ush Bot · ushbot, Ushahidi] [ushbot] [Ush Bot · ushbot, Ushahidi] [ushbot] [Ush Bot · ushbot, Ushahidi] [ushbot] [Ush Bot · ushbot, Ushahidi] [ushbot] [Will, Ushahidi] does that help? [Ush Bot · ushbot, Ushahidi] [ushbot] [Ush Bot · ushbot, Ushahidi] [ushbot] [Ush Bot · ushbot, Ushahidi] [ushbot] [Ush Bot · ushbot, Ushahidi] [ushbot] [Ush Bot · ushbot, Ushahidi] [ushbot] [Ush Bot · ushbot, Ushahidi] [ushbot] [Ush Bot · ushbot, Ushahidi] [ushbot] [Ush Bot · ushbot, Ushahidi] [ushbot] [Ush Bot · ushbot, Ushahidi] [ushbot] [Ush Bot · ushbot, Ushahidi] [ushbot] [Ush Bot · ushbot, Ushahidi] [ushbot] [Ush Bot · ushbot, Ushahidi] [ushbot] [Ush Bot · ushbot, Ushahidi] [ushbot] [Ush Bot · ushbot, Ushahidi] [ushbot] [Ush Bot · ushbot, Ushahidi] [ushbot] [Ush Bot · ushbot, Ushahidi] [ushbot] [Ush Bot · ushbot, Ushahidi] [ushbot] [Ush Bot · ushbot, Ushahidi] [ushbot] [Ush Bot · ushbot, Ushahidi] [ushbot] [Ush Bot · ushbot, Ushahidi] [ushbot] [Ush Bot · ushbot, Ushahidi] [ushbot] [Ush Bot · ushbot, Ushahidi] [ushbot] [Ush Bot · ushbot, Ushahidi] [ushbot] [Ush Bot · ushbot, Ushahidi] [ushbot] [Ush Bot · ushbot, Ushahidi] [ushbot] [Ush Bot · ushbot, Ushahidi] [ushbot] [Ush Bot · ushbot, Ushahidi] [ushbot] [Ush Bot · ushbot, Ushahidi] [ushbot] [Ush Bot · ushbot, Ushahidi] [ushbot] [Ush Bot · ushbot, Ushahidi] [ushbot] [Ush Bot · ushbot, Ushahidi] [ushbot] [Ush Bot · ushbot, Ushahidi] [ushbot] [Ush Bot · ushbot, Ushahidi] [ushbot] [Ush Bot · ushbot, Ushahidi] [ushbot] [Ush Bot · ushbot, Ushahidi] [ushbot] [Ush Bot · ushbot, Ushahidi] [ushbot] [Ush Bot · ushbot, Ushahidi] [ushbot] [Ush Bot · ushbot, Ushahidi] [ushbot] [Ush Bot · ushbot, Ushahidi] [ushbot] [Ush Bot · ushbot, Ushahidi] [ushbot] [Ush Bot · ushbot, Ushahidi] [ushbot] [Ush Bot · ushbot, Ushahidi] [ushbot] [Ush Bot · ushbot, Ushahidi] [ushbot] [Ush Bot · ushbot, Ushahidi] [ushbot] [Ush Bot · ushbot, Ushahidi] [ushbot] [Ush Bot · ushbot, Ushahidi] [ushbot] [Will, Ushahidi] does that help? [Ush Bot · ushbot, Ushahidi] [ushbot] [Ush Bot · ushbot, Ushahidi] [ushbot] [Ush Bot · ushbot, Ushahidi] [ushbot] [Ush Bot · ushbot, Ushahidi] [ushbot] [Ush Bot · ushbot, Ushahidi] [ushbot] [Ush Bot · ushbot, Ushahidi] [ushbot] [Ush Bot · ushbot, Ushahidi] [ushbot] [Ush Bot · ushbot, Ushahidi] [ushbot] [Ush Bot · ushbot, Ushahidi] [ushbot] [Ush Bot · ushbot, Ushahidi] [ushbot] [Ush Bot · ushbot, Ushahidi] [ushbot] [Ush Bot · ushbot, Ushahidi] [ushbot] [Ush Bot · ushbot, Ushahidi] [ushbot] [Ush Bot · ushbot, Ushahidi] [ushbot] [Ush Bot · ushbot, Ushahidi] [ushbot] [Ush Bot · ushbot, Ushahidi] [ushbot] [Ush Bot · ushbot, Ushahidi] [ushbot] [Ush Bot · ushbot, Ushahidi] [ushbot] [Ush Bot · ushbot, Ushahidi] [ushbot] [Ush Bot · ushbot, Ushahidi] [ushbot] [Ush Bot · ushbot, Ushahidi] [ushbot] [Ush Bot · ushbot, Ushahidi] [ushbot] [Ush Bot · ushbot, Ushahidi] [ushbot] [Ush Bot · ushbot, Ushahidi] [ushbot] [Ush Bot · ushbot, Ushahidi] [ushbot] [Ush Bot · ushbot, Ushahidi] [ushbot] [Ush Bot · ushbot, Ushahidi] [ushbot] [Ush Bot · ushbot, Ushahidi] [ushbot] [Ush Bot · ushbot, Ushahidi] [ushbot] [Ush Bot · ushbot, Ushahidi] [ushbot] [Ush Bot · ushbot, Ushahidi] [ushbot] [Ush Bot · ushbot, Ushahidi] [ushbot] [Ush Bot · ushbot, Ushahidi] [ushbot] [Ush Bot · ushbot, Ushahidi] [ushbot] [Ush Bot · ushbot, Ushahidi] [ushbot] [Ush Bot · ushbot, Ushahidi] [ushbot] [Ush Bot · ushbot, Ushahidi] [ushbot] [Ush Bot · ushbot, Ushahidi] [ushbot] [Ush Bot · ushbot, Ushahidi] [ushbot] [Ush Bot · ushbot, Ushahidi] [ushbot] [Ush Bot · ushbot, Ushahidi] [ushbot] [Ush Bot · ushbot, Ushahidi] [ushbot] [Ush Bot · ushbot, Ushahidi] [ushbot] [Ush Bot · ushbot, Ushahidi] [ushbot] [Ush Bot · ushbot, Ushahidi] [ushbot] [Ush Bot · ushbot, Ushahidi] [ushbot] [Ush Bot · ushbot, Ushahidi] [ushbot] [Will, Ushahidi] does that help? [Ush Bot · ushbot, Ushahidi] [ushbot] [Ush Bot · ushbot, Ushahidi] [ushbot] [Ush Bot · ushbot, Ushahidi] [ushbot] [Ush Bot · ushbot, Ushahidi] [ushbot] [Ush Bot · ushbot, Ushahidi] [ushbot] [Ush Bot · ushbot, Ushahidi] [ushbot] [Ush Bot · ushbot, Ushahidi] [ushbot] [Ush Bot · ushbot, Ushahidi] [ushbot] [Ush Bot · ushbot, Ushahidi] [ushbot] [Ush Bot · ushbot, Ushahidi] [ushbot] [Ush Bot · ushbot, Ushahidi] [ushbot] [Ush Bot · ushbot, Ushahidi] [ushbot] [Ush Bot · ushbot, Ushahidi] [ushbot] [Ush Bot · ushbot, Ushahidi] [ushbot] [Ush Bot · ushbot, Ushahidi] [ushbot] [Ush Bot · ushbot, Ushahidi] [ushbot] [Ush Bot · ushbot, Ushahidi] [ushbot] [Ush Bot · ushbot, Ushahidi] [ushbot] [Ush Bot · ushbot, Ushahidi] [ushbot] [Ush Bot · ushbot, Ushahidi] [ushbot] [Ush Bot · ushbot, Ushahidi] [ushbot] [Ush Bot · ushbot, Ushahidi] [ushbot] [Ush Bot · ushbot, Ushahidi] [ushbot] [Ush Bot · ushbot, Ushahidi] [ushbot] [Ush Bot · ushbot, Ushahidi] [ushbot] [Ush Bot · ushbot, Ushahidi] [ushbot] [Ush Bot · ushbot, Ushahidi] [ushbot] [Ush Bot · ushbot, Ushahidi] [ushbot] [Ush Bot · ushbot, Ushahidi] [ushbot] [Ush Bot · ushbot, Ushahidi] [ushbot] [Ush Bot · ushbot, Ushahidi] [ushbot] [Ush Bot · ushbot, Ushahidi] [ushbot] [Ush Bot · ushbot, Ushahidi] [ushbot] [Ush Bot · ushbot, Ushahidi] [ushbot] [Ush Bot · ushbot, Ushahidi] [ushbot] [Ush Bot · ushbot, Ushahidi] [ushbot] [Ush Bot · ushbot, Ushahidi] [ushbot] [Ush Bot · ushbot, Ushahidi] [ushbot] [Ush Bot · ushbot, Ushahidi] [ushbot] [Ush Bot · ushbot, Ushahidi] [ushbot] [Ush Bot · ushbot, Ushahidi] [ushbot] [Ush Bot · ushbot, Ushahidi] [ushbot] [Ush Bot · ushbot, Ushahidi] [ushbot] [Ush Bot · ushbot, Ushahidi] [ushbot] [Ush Bot · ushbot, Ushahidi] [ushbot] [Ush Bot · ushbot, Ushahidi] [ushbot] [Ush Bot · ushbot, Ushahidi] [ushbot] [Ush Bot · ushbot, Ushahidi] [ushbot] [Will, Ushahidi] does that help?